UPDATED: Tue., March 18, 2014, 9:01 p.m.
Washington State athletic director Bill Moos announced on Tuesday that fifth-year head coach Ken Bone will not return to coach the Cougars next season, despite two years remaining on his fully-guaranteed contract. Here is a look at some of the candidates Moos may consider in his search for the next WSU coach. Though the Grizzlies have had a subpar season and exited in the first round of the Big Sky championship tournament, Montana has generally been successful under Tinkle and made it to the NCAA tournament in the previous two seasons. A Spokane native, the 48-year-old Ferris High School graduate would fit in well in Eastern Washington. However, Ken Bone was a Big Sky coach before coming to WSU, which may cause some skepticism of Tinkle among WSU fans. Howland is about as big a name as WSU could realistically hope for, having taken UCLA to three consecutive Final Fours in the past decade. Howland’s star faded in the latter half of his tenure with the Bruins as UCLA missed the NCAA tournament twice in his last four years and didn’t make it past the second round in his final five seasons. Howland was also the subject of a large Sports Illustrated article that made him appear responsible for a lack of discipline in the UCLA program. Still, it may be hard to convince someone who has coached at a school with 11 national championships to come to a school with just six NCAA tournament appearances. Currently: Not coaching Previously: Oregon head coach, 13 seasons (235-174) Kent was the first basketball coach hired by Moos when he was the athletic director at Oregon and he could be Moos’ first at WSU. The two reportedly still have a strong relationship and Kent, now an analyst for the Pac-12 Networks, is rumored to want to get back into coaching. At UO he was known as a strong recruiter, pulling NBA players such as Luke Ridnour and Aaron Brooks out of Washington. One thing working against the Cougars may be Kent’s age as the 59-year old may not want to take on an extensive rebuilding project. The 1986 WSU grad has spent his entire coaching career in the Northwest, first as a graduate assistant and then assistant coach at Oregon before becoming as assistant at Gonzaga for 11 seasons and finally as the BSU head coach since 2010. Rice led the Bronco’s to their first-ever NCAA tournament berth last season and his teams have won 20-plus games in three of his four seasons. PULLMAN – Ken Bone’s tenure as Washington State basketball coach ended shortly after 10 a.m on Tuesday morning. WSU athletic director Bill Moos fired Bone during their annual end-of-season meeting. “We’ve gone in a (downward) direction. It’s not good enough,” said Bone, who finished with a 80-86 record at WSU and 28-61 in the Pac-12. After reaching the NIT semifinals in his second season the Cougars have won fewer games every year. Bone will still receive the final $1,700,000 he is owed for the remaining two years on his seven-year contract. Assistant coach Curtis Allen will be the team’s interim coach. Moos said that he decided to go in a new direction over the final third of WSU’s season. Moos said that he would meet with assistants Allen, Rod Jensen and Ray Lopes and possibly recommend that one or more be retained. However, the new coach will make the final decision. No prospective replacements were contacted during the season, according to Moos. He did say, however, that he had sought counsel from different people with regards to future candidates. Former athletic director Jim Sterk hired Bone at WSU shortly before leaving to take the same position at San Diego State. Bone was previously the head coach at Portland State where he posted consecutive records of 23-10 and took the Vikings to back-to-back NCAA tournaments. But the Cougars never sniffed the tournament in Bone’s tenure at WSU. Bone’s predecessor at WSU, Tony Bennett, guided his Virginia team to a No. 1 seed in the upcoming NCAA tournament. The Cougars went 10-21 this season and 3-15 in conference play. Not good enough. Last November, Moos told a group of boosters that Bone’s lack of a contract extension was “a hint” during an Apple Cup-preceding event at the Spokane Country Club. Bone said that Moos was very supportive of himself and the team this season and that speculation about his possible termination was never a distraction. Although Bone will be paid his salary for the final remaining two seasons on his contract whether or not he takes another coaching job, he does not plan on taking any time off and was adamant about his desire to coach again in the near future. Even on the first Monday of Spring Break with his future at WSU in doubt and the entire offseason ahead of him, Bone was working in his offices until the late evening. The Cougars were hampered this season by the midseason injury to leading scorer DaVonte Lacy as well as the preseason loss of Danny Lawhorn, who was recruited out of junior college to be the team’s starting point guard. Lawhorn was suspended before the season and left the team shortly thereafter. It was the second year without a true starting point guard after Reggie Moore was let go prior to last season. The Cougars played their best basketball at the end of the season, although it wasn’t enough to make any sort of postseason run. WSU beat eventual Pac-12 tournament champion UCLA in the final game of the regular season, 73-55. 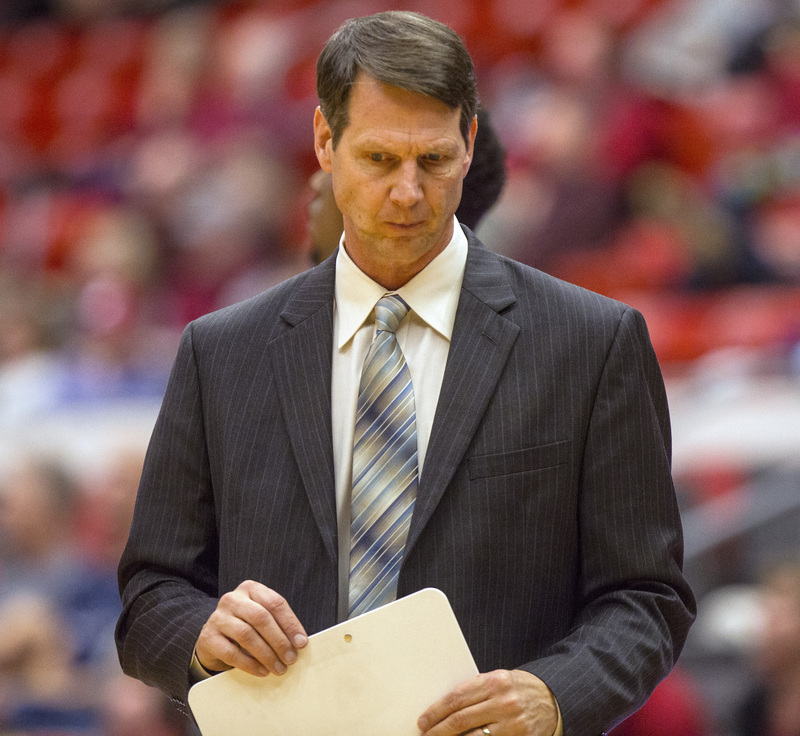 The Cougars lost to Stanford, 74-63, in the final game of Bone’s tenure. Published: March 18, 2014, 10:42 a.m. Updated: March 18, 2014, 9:01 p.m.